JOHNSTOWN — The 2013 annual report of Goodwill of the Southern Alleghenies, given Tuesday at the Holiday Inn Downtown, was anything but cut and dried. More than a time for statistics, the event also celebrated the year’s award winners. Adelena Tinari, who works in Goodwill’s retail store in Westwood, received an award for achiever of the year. She first came to Goodwill in 2010 as a vocational student trainee through Intermediate Unit 8 and her high school. Tinari worked with clothing donations, placing them on hangers and hanging them on a rack for customers. At that time, she worked one day a week for four hours, hanging an average of 150 pieces of clothing. Tinari now works five days a week for five hours, hanging 360 pieces of clothing per day. She is overcoming her shyness and developing her vocational skills. Jill Connor, another achiever of the year award winner, was not able to attend the luncheon and awards ceremony because she was on the job as a full-time medical assistant with Conemaugh Physicians Group. Connor was hired for the job in November because of her participation in Goodwill’s Community Employment Services program. After losing her full-time job in the medical field because of budget cuts almost three years ago, the single mother had to move in with her mother while she searched for a job with a decent wage. Anxiety and depression set in, and Connor sought counseling from an agency that later referred her to Goodwill in September. Her employment counselor and job coach helped her pursue jobs, followed up with leads and referrals and provided overall counseling. The next award winners come in a pair – mentor Dan Lovrich and the person he mentored, Nick Yost. They met and worked together through Goodwill’s GoodGuides Youth Mentoring Program. Lovrich became one of the first mentors with the launch of GoodGuides in January 2010, and Nick was referred by his school guidance counselor in December 2010, when he was in seventh grade and grieving the death of his father. Now a sophomore, Nick is on track to be the first generation of his family to go to college. Overcoming his shyness, Nick is joining in social activities at school and in the community, even participating in his school’s spring show. Nick said his mentoring experience taught him to never give up and to care about others. The last award winner was the Richland store of retailer T.J.Maxx. 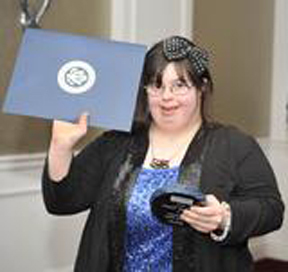 In order to carry out its mission to help people with disabilities and other barriers to find employment, Goodwill offers community-based work assessments, which allow individuals to try out jobs and test their skills in a specific field, and paid work experiences which enable students to gain job skills and earn paychecks. T.J.Maxx was especially supportive in 2013, providing an opportunity for 12 students to complete community-based work assessments and serving as a paid work site for two students. Staff members said the young people were an asset to their business, working hard and doing the job the way they were taught.